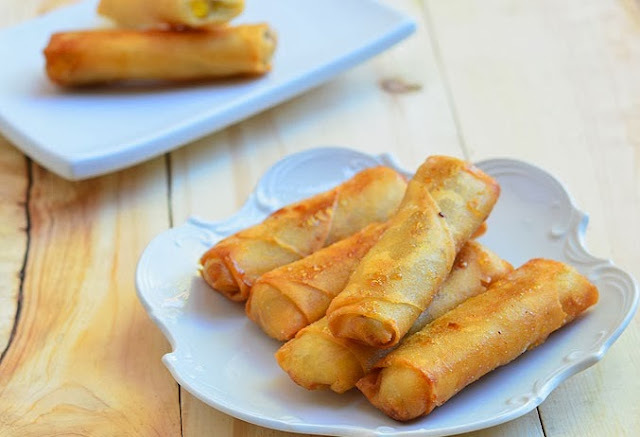 Turon or deep-fried banana rolls is a typical Filipino meryenda and dessert. This can usually be seen on the streets being peddled along with banana-que. Turon is made of thinly sliced bananas and a slice of jackfruit, dusted with brown sugar, rolled in a spring roll wrapper and fried. 1. Prepare bananas by peeling and cutting lengthwise into two halves. Roll in sugar. 2. Separate wrappers into individual sheets. On a flat working surface, lay wrapper like a diamond. Arrange 1 banana slice in the middle of diamond and place 2 to 3 jackfruit strips lengthwise on top of banana slice. 3. Fold bottom pointed end of wrapper over filling. Fold side ends of the sheet inward and roll into a log. Wet the pointed edge of the wrapper to completely seal. 4. Roll sealed springrolls in sugar. Repeat with the remaining bananas. 5. In a skillet over medium heat, heat about 1 inch of oil. Add banana springrolls seam side down and fry, turning once or twice, for about 3 to 5 minutes on each side or until golden brown.